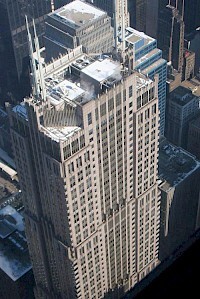 The AT&T Corporate Center is the 5th tallest completed skyscraper in Chicago in Cook County, Illinois, United States and the 9th tallest in the United States at a height of 1,021 ft (307 m) containing 60 floors. 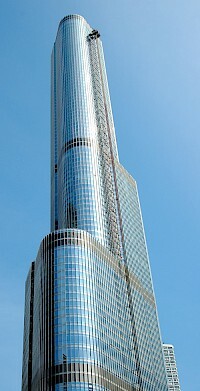 Completed in 1989, the 1.7 million square foot (158,000 m²) supertall building stands two blocks east of the Chicago River and northeast of the Willis Tower at 227 West Monroe Street (100 South Franklin alternate address) in the Loop community area of downtown Chicago. The NBC Tower is an office tower on the Near north side of Chicago, Illinois, United States. It is also the home studios and offices for the NBC owned station in Chicago, WMAQ-TV, and the radio studios for CBS Radio's sports radio station WSCR (AM), which were formerly in use under WSCR's original operation, WMAQ (AM). 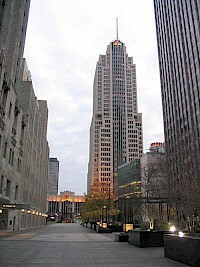 Completed in 1989, the 37-story building reaches a height of 627 feet (191 m). The design, by Adrian D.